In the adventure game North Wind, cities are suffering heavily under constant raids from pirates. As freelance trade captains, the players bring food and other goods to the cities, in addition to fighting the pirates whenever they encounter them. Fighting without cannons leads to poor results, however, and cannons are expensive. With each success, though, a player can better equip his three-dimensional ship and strengthen his crew. Pirates are raiding the nearby cities that are part of the Trade Alliance. The battered harbor towns call on your help, the Captains of the Alliance. Your tasks will be numerous, and some more dangerous than others. From supplying the towns with various goods to surviving encounters with deadly pirates, your ship will be your life. Let the North Wind carry your ship to victory! In the end, the player who finds the best mix of trading and fighting will prove to be the victorious captain. 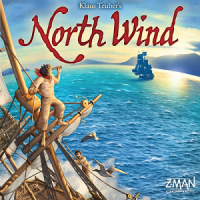 Add a Review for "North Wind"